Let me get this out there right away: I hate email. Seriously, I can’t stand it. It’s not that I have any particular problem with the medium; in fact, I’m not even one of those people that believes it should be replaced with a radical alternative. I despise it because it eats up so much of my time. It’s nothing to do with the way email works; it’s purely down to the volume of email I receive. 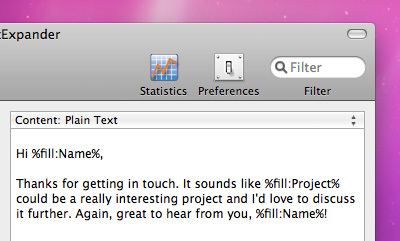 So when a tool comes along to help me get email out of the way a lot quicker, I’m excited. Without a doubt, TextExpander is that tool. I’ve been using it for just over a month and I honestly don’t know how I could now live without it. TextExpander isn’t new. It’s been around for years and I’d managed to completely miss it. I think in the back of my mind I was aware of it, but had assumed it was something to do with a code editor. I only came across it properly when reading Frank’s post about his Mac set-up. From the first hour of using the app, I knew it would change the way I write and — most importantly — allow me to finally conquer email. So, for the benefit of those who have never considered it — and for Sarah, for whom I promised to write this article — I’m going to explain why this is an essential app for anyone who receives a high volume of email, or regularly has to write similar responses, or makes dumb typos, or just wants to get a bit more time for the important things in life, like quaffing delicious Belgian beers. My completely non-scientific research has found that the number of times one writes the same thing is explicitly tied to the number of emails one receives. In other words, it’s the law of averages. Like many people, I find myself writing the same thing over and over and over again, with very subtle alterations. I’m not talking about ‘canned responses’ per se; there’s usually something a bit different about each instance, whether that be responding to new client work requests, asking potential clients to clarify timeline and budget, or respond to 8 Faces customers whose copy never arrived. About 90% of each message is usually the same, but requires some element of personalisation (which is important to good customer service, anyway). It’s in these subtle differences that TextExpander excels. Let’s say our fictional potential client has forgotten to mention his budget and timescale. 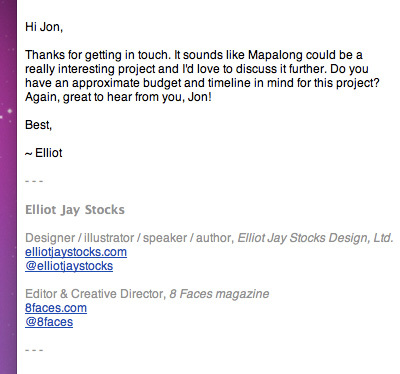 (A client forgetting to mention budget and timeline? Surely not!) Then, I place my cursor just before the last sentence, type my trigger text ‘bbudget’ and TextExpander renders ‘Do you have an approximate budget and timeline in mind for this project?’ Perfect. Now, I want to sign off with my professional signature, so I type ‘ssig2’ and out comes the signature with my links and what not. We’re so winning at email. Tigerblood! It feels like it’s been years since I last actually typed my name. Another benefit of it being system-wide is that it’s perfect for code snippets. Virtually every code editor has snippet functionality, but defining your snippets in TextExpander means you can jump between text editors — say, TextMate on your desktop and Harmony’s in-browser editor — and still have all your snippets working. In conclusion: go and buy it! I’ve encountered a few people are a little turned off by the price of TextExpander. At $34.95, some feel that it’s a little expensive for an auto-complete tool, but if you judge your apps’ worth on how much time they save you, this is probably one of the best software investments you’ll ever make. We’re probably only talking about saving a few seconds with each trigger, but those seconds add up. Use TextExpander for a 30 minute email session, and you’ll instantly see how much quicker you’re getting through your replies. There is one downside to using TextExpander, though: as soon as you well your friends that you’re using it, they’ll assume they’re the victim of your auto-completes!